Let’s face it: prepping is a complex matter and it can be overwhelming to the newbie. Which knife to get? What foods should I stockpile? What disaster is most likely to affect me? How can I convince my spouse to join my efforts? Do I really need to buy all of this stuff? Where am I gonna keep everything? Should I buy MREs? The truth is, there are a lot of newbie mistakes to be made and, some of them could cost you a lot of money… or worse. Let’s see what some of the biggest ones are so you can side-step them. The best piece of advice I can give you is not to buy anything until you get to read more about survival. You need to figure out what your priorities are and what you should prep first because you can’t do everything at once. Since the prepping market is mainstream now, there are thousands of survival companies trying to sell stuff. You only have to buy what you decide you need, not what some sales letter tells you to. Then go to YouTube and Amazon and type the same thing. The cool thing about Amazon is that you can go through dozens and dozens of reviews from other users that tell you every problem they had with them. Negative reviews are the first ones I look at but beware some users have a habit of giving negative reviews to all products. [knife name] what do you think? These will reveal potential problems with the knives you’re about to buy as well as alternative products. MREs sound like a good idea because – hey – if they’re good enough for the military, they must be good enough for you. Not only are MREs expensive but they taste very, very bad (more on why that is here). This is no way to start a stockpile as there are other foods that are cheaper, tastier and more nutritious. You can pick from: freeze-dried food, hard candy, energy bars and other snacks with a long shelf life are all good for your bug out bag because of the weight. Buying things is easy; that’s why the vast majority of preppers do it instead of focusing on long-term survival plans. Well, purchasing survival tools and gear is only half the story. A fool with a tool is still a fool, the saying goes and skill will always trump guns, gear and a generous stockpile. Man, I can still remember throwing my printed copy of the SAS Survival Guide in my bag – it was HEAVY. The whole thing felt incredibly light once I removed it! Right now, the heaviest thing in my BOB is my stainless steel water bottle, filled with water, of course. Not everything belongs in your BOB. There’s a high probability that you’ll be bugging in during the next disaster and you need to have the necessary survival items to hunker down for days, even weeks. The best ways to assemble your first bug out bag is to start with a checklist. Of course, before you add anything to, think really well in what scenarios it might be of use to you. Once you have it, start adding items one by one in decreasing order of important. Speaking of heavy backpacks, do you know how long you can carry yours during a bug-out? Regardless of how much it weighs, you’ll find out just how exhausting it can be. I found out the hard way when I tested it a couple of months ago. It was me, a friend and two girls. I was the only one with a backpack and I was left behind most of the times because of the weight I was carrying, despite me also wearing hiking boots and the trail being wet and even muddy at some point. There are three types of preppers: those who will bug in, those who will bug out and those who will bug out but have no idea where. You don’t want to be in the latter category and if you’re prepping to bug in, you should still consider bugging out as an option. You just never know when your home or town becomes uninhabitable. I think the secret reason why most people decide to bug in is because it’s easier to prep for. Still, I insist you give both scenarios (bugging in and out) some serious thought. Having an emergency plan is not complicated. You start by prepping for personal emergencies and small-scale disasters that can last up to 72 hours: tornadoes, hurricanes, earthquakes, car crashes, heavy snow, flash floods etc. Just the ones that are more likely to happen to you, of course. You need a bug in plan, a bug out plan, a get home plan (in case you’re not at home when it happens) as well as a communications plan (so you stay informed with the latest developments). 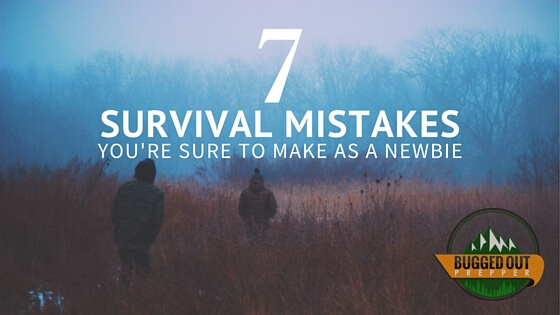 Did you make any of those mistakes or others as a newbie? Leave a comment below. When it comes to staying warm, your sleeping bag is the most important piece of gear you’ve got. As you sleep, your body’s metabolism naturally shuts down. You aren’t doing the physical activity typical to daylight hours, so your body isn’t generating enough heat. That makes it easier to get cold and even to fall into hypothermia. Besides all this, when hypothermia is coming on, your sleeping bag is the best defense against it. With that in mind, buying a good sleeping bag is an important part of creating an effective bug out bag; especially for the wintertime. While you can get by with much less in the summer, or even sleeping out in the open, winter survival doesn’t leave that option. The North Face is one of the biggest manufacturers of serious backpacking equipment there is. Their designs are created by people who use the equipment, ensuring useful innovation. Everything The North Face produces is high quality, which makes it not all surprising that I’ve picked them for having the best sleeping bag around. 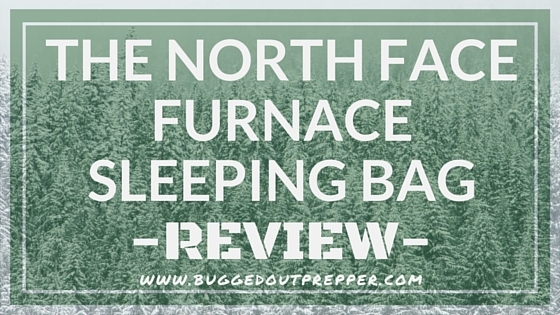 The Furnace Sleeping Bag from The North Face is everything I could ask for in a sleeping bag. A mummy style bag, it is designed for temperatures down to zero degrees Fahrenheit. It is filled with 550ProDown, natural goose down for warmth, as well as great compressibility. There’s also a Heatseeker Eco anit-compression insulation layer to act as a buffer between your body and the cold ground. Although a mummy bag, the North Face Furnace Sleeping Bag has a more relaxed taper, giving you more room to move around. If you’re the type of person who tends to toss and turn in your sleep, that’s a great advantage. I know people who can’t sleep in a mummy bag, because they can’t move. Well, in this one, they could sleep just fine. There’s also a vaulted footbox, allowing more room for your feet in a natural, ergonomic position. All in all, a much more comfortable bag to sleep in. Making the bag comfortable didn’t sacrifice anything in warmth though. A shaped hood and draft collar helps hold heat in, as well as a durable, as well as a full length draft tube alongside the zipper. The zipper has a glow in the dark zipper pull, so you can find your way out, even in the dark. The exterior shell of the North Face Furnace Sleeping Bag is durable, embossed, water resistant polyester taffeta and the inside is a soft polyester taffeta lining. This helps keep the bag dryer, so that it will continue to keep you warm. The taffeta lining prevents the bag from sticking to your skin, while helping keep you warm and comfortable. With all those great features, this bag lives up to its name of being “The Furnace.” But there’s one other feature, which may be the most important of all. This great sleeping bag weighs only 3 pounds, 8 ounces, packed up and ready to go. It stuffs into its included stuffsack, making a bundle that’s only 10″ in diameter by 19″ long. Many people have a somewhat romanticized idea of bugging out. They see themselves camping out under the stars, cooking their freshly caught fried chicken over a campfire. The girl of their dreams is sitting there, waiting to enjoy dinner with them and someone is playing a guitar or maybe a violin in the background. Unfortunately, reality isn’t that kind. If any of us are forced to bug out, it will be a definite survival situation, with all the problems that entails. Even catching that chicken rabbit will be a problem, let along being able to cook it out there in the wild. While cooking over a campfire does work and can actually work quite well, the first couple of times you try it will probably be a disaster. You’ll end up with burned, inedible whatever, rather than that sumptuous repast you were expecting. Putting your expensive backpacking cookware directly into the fire is a good way to damage it. Your food will probably be burnt on the outside and raw in the middle as well. While you can cook over a campfire just fine, you need to know how to do it. 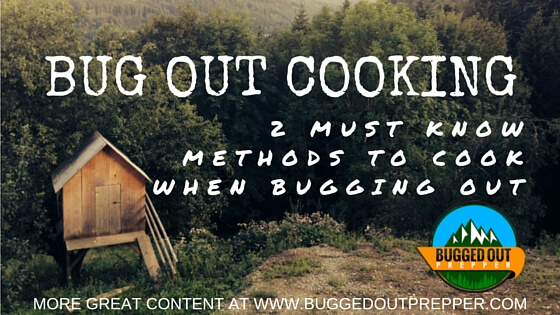 There are two basic methods for cooking over a campfire effectively. Actually, there are three, but I don’t think you’re going to be carrying a cast-iron Dutch oven in your bug out bag. The first is to put the pot on a flat rock, right next to the fire. Heat the rock first, by putting coals on it and allowing them to burn for a while. Then scoop them off with a stick or camp shovel, to put your pot on there. The second way is to suspend the pot over the fire. There are several different ways of suspending a pot over the fire, such as making a tripod to suspend it from or putting a couple of poles into the ground to make something like a spit to hang it off of. But the easiest way to hang a pot over the fire is to cantilever a stick over the fire to hang the pot from. In order to do this, cut a green stick that’s strong enough to hold the weight of the pot, without bending. You’ll want to have a fork in the stick at the hanging end, to put the wire handle of the pot into. The other end of the stick should lean on one of the rocks around your fire. Place the very end of the stick on the ground and hold it down with another rock. This should leave your stick angling up, with the highest point roughly over the center of your fire. Your other option is to use a stove. Personally, I prefer this method, although I am rather picky about the type of stove that I’ll use. Stoves that require propane tanks, butane or liquid fuel force you to carry a supply of fuel with you. While that’s fine for a three day backpacking trip, it’s not so great for a bug out. When you run out of fuel, your stove becomes useless. I prefer carrying a stove that allows me to burn sticks or other fuel that I find. While they might not be as easy to start as a butane stove, they are more reliable over the long haul. This is the actual stove I currently have in my bug out bag, although there are a number of other excellent models out there, such as the Titan from Solo Stove. One I have always been intrigued by and been tempted to buy is the BioLite Campstove. This little wood burning stove not only provides heat to cook your food, but somehow creates electricity to charge your cell phone at the same time. Although I am not highly in favor of carrying a stove that requires special fuel, I also carry an Esbit stove with me, as a backup. If I happen to be somewhere where I can’t find sticks to burn or all of them are wet, this gives me a sure way of being able to make a cup of coffee or cook my food. Esbit makes a number of models, but this one is the one that I carry. There’s a very common problem that many people run into when they first become interested in prepping; that’s the problem of their spouse, or in the case of those who aren’t married, their “significant other” as the politically correct term has come to be known. It’s rare that a couple both develop an interest in prepping at the same time. Usually, one sees what’s happening in the world around them and decides they need to do something, while the other has their eyes closed to all that. Even worse than having a spouse who’s eyes are closed to the problems we all face is having one that wants their eyes closed. Maybe they just don’t like to think about anything bad happening, but more likely they are counting on Big Brother government to take care of them. They haven’t realized that the government has a very poor track record of doing that. 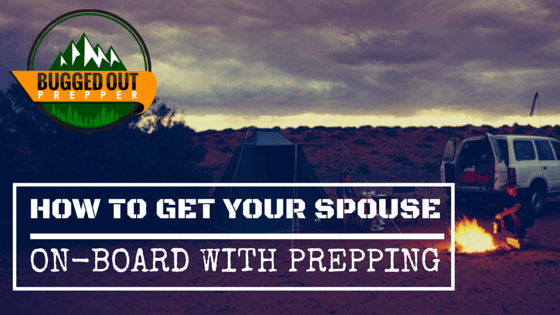 Prepping without your spouse can be an especially challenging proposition. Not only does it help to work together on doing all that needs to be done, but there’s the problem of money. Spending money on stockpiling food and other supplies, when your spouse isn’t in agreement, can become a bone of contention in any marriage, especially when spending that money means that you might not be able to do something else that your spouse wants to do. It’s clearly better to have both partners on-board with prepping. But how do you get that reluctant spouse going? What can you do, if they just don’t see things the way you do? First of all, be realistic. You’re not going to make any headway talking about the Yellowstone Supervolcano blowing up the country or the Earth’s axis shifting. Get them on board with seeing the risk of hurricanes or winter blizzards; any local weather problem which could leave you without power or the ability to go to the grocery store. Once they are on board with the little disasters, you can gradually work your way up to the bigger ones. Part of the reason that your spouse may not see the need to be prepping is that they don’t see the world situation as you do. Maybe you watch the news and they don’t. If that’s the case, you are much more likely to see the risks that we face every day than they are. Educate them, so that they will know why there’s a good reason to be a prepper. Don’t try to go off the deep end, selling your home and moving to a bunker, hidden in the middle of nowhere. Decide on doing preps that are in alignment with the risks you are talking about, not an end of the world scenario. As they come on board, you can gradually up the ante, looking at bigger risks and what you should do to be ready for them. You’ve got to realize that it took time for you to get into the prepping mindset and it’s going to take time for them to do so as well. You can’t expect that the conclusion which you reached after months of thinking about prepping is going to hit them in one short conversation. You’ll probably need a number of conversations, each of which helps them come to understand the problems that you see. There are things you can do to start prepping, which don’t necessarily look like prepping, especially if you can attribute them to some other reason. Planting a vegetable garden can be because you don’t like the idea of GMOs, instead of for prepping. Then you can start canning, to preserve what you’ve grown. Put in a rainwater collection system, as a way of saving money on watering the garden and avoiding putting all that chlorine in the garden. Things like this make sense in a non-prepper world, but help you to be prepared as well. You can also buy some survival equipment, without the need to make it look like prepping. It could be emergency equipment for the car or camping equipment, rather than bug out equipment. Buying a gun or a hunting knife makes sense for hunting or just shooting. You don’t need to shove it in their face that you are prepping, just work on it subtly. Are you having trouble getting your spouse or significant other on-board with prepping? If so, share your situation and/or comments below. Picking a backpacking tent to use as a bug out tent can be challenging, especially for those who aren’t experienced backpackers. Many of the subtle differences that will make one tent stand out over another to the seasoned backpacker, may fly right over the heads of the rest of us. One could respond to that by saying “Buy the most expensive and you’ll have the best.” But most of us really can’t afford to buy the most expensive, especially considering that the only time we’d use it is while bugging out. Most preppers have to strike a balance between cost and features. While we might all want the best, we are practical people. As such, we look for something that will give us the best possible service, for a reasonable price. So, we need to understand what those high prices are buying for us. In the area of backpacking tents, there are a number of features which can drive up price, but the most glaringly obvious is weight. Two person backpacking tents can range from five to nine pounds. Invariably, the lighter the tent is, the higher its price. So, when you’re looking at a $200 tent, you’re not getting more space; you may not be getting a much more durable tent; mostly, you’re getting a lighter one. The Coleman Hooligan series of backpacking tents are a great mid-range tradeoff tent series for the average prepper. They make Hooligan tents for two to four people. We’re specifically looking at the two-person one here. This is what is known as a three-season tent. It’s two layer construction helps keep you comfortable and dry, even in inclement weather. The inner wall is made of mesh to keep insects out. On warm nights, you could remove the outer cover and allow the cool breeze to blow over you, without having to let the mosquitoes in to interrupt your sleep. The outer shell is waterproof, protecting you and keeping you dry. The floor is also built to keep you dry as well, extending up the sides to keep water from running into the tent. That saves you from having to put a ground sheet under the tent, as well as not having to worry about digging a drainage ditch around it. The outer shell is zippered, forming a dry vestibule at the entrance. This allows you to take off wet boots and outer garments, before entering into the tent itself. With one half of the vestibule open, the other half continues to provide protection from the wind, so you don’t get cold while you are trying to work your way in to the tent. This tent design uses one continuous, fiberglass tent pole, which goes over the center of the tent, long-wise. The fiberglass pole is 11mm in diameter and is sectional, with elastic cord to help pull it together. Stakes around the corners and guy lines finish off the assembly. This single pole design is very easy to erect, allowing you to have your tent up and ready for occupancy in ten minutes or less. The Hooligan isn’t the lightest backpacking tent around, coming in somewhere around the middle of the pack at just over 7 pounds. But to cut a pound out of the weight, you’d have to spend $100 more. That makes this tent a great compromise that will serve you well. I’ve said it before and I’ll say it again; a good knife is the most important piece of survival gear you can carry. But what makes a good knife? What should you look for in it, to make sure that it won’t let you down when you really need it? 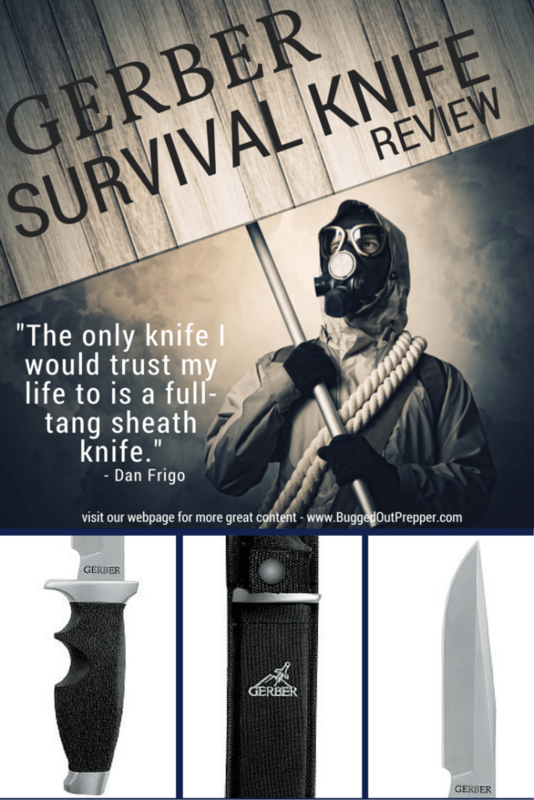 Before looking at my choice of a survival knife, let’s talk about that. The first absolute must in any knife that you’re going to depend on is quality. Remember, you’re trusting this tool to keep you alive. The last thing you need is to buy some cheap knife that doesn’t last. That’s why I always stick with proven brands. Oh, those Damascus steel knives out there look pretty, but they aren’t commercially made knives, so there’s no way of knowing how good each one really is. The only knife I would trust my life to is a full-tang sheath knife. A folding knife is great for a backup, but not as a primary survival knife. Generally speaking, the thicker the steel used for the knife blade, the stronger it is. Or, to put it another way, the thicker the steel, the better the knife. Now let’s take a look at the knife. I chose a Gerber Steadfast Fine Edge Knife as my primary survival knife for a number of reasons. First of all, I’ve always liked Gerber’s quality. Dollar for dollar, I feel you get more for your money with a Gerber knife than you do with a lot of other brands. Even though they’re a quality knife, they don’t seem to get the attention that some other brands do. That helps keep their prices reasonable. With a 5-1/2 inch blade, it’s long enough for just about anything, without being so long as to be awkward. It’s a single-edged blade, with a sharp point. Some people like double-edged blades for survival knives, but in a lot of states they’re illegal to carry. There’s always the possibility that I’ll have a survival situation where police will still be around, such as an evacuation for a hurricane, in that case, I want my knife to be legal to carry; my Gerber is. A lot of people go for serrated blades on survival knives, but I’ve yet to find a place where I really wanted one. The only use I know for a serrated blade is cutting rope on a sailboat. Other than that, you’re usually better off with a full edge on the blade. Two inches of serration really isn’t enough for cutting firewood or even tent poles; you’re better off using a saw. A sharp point on the knife creates a weakness, so that is one weak point on the Gerber. However, it also comes in handy when you have to put a hole in a tarp or hide for lacing something together. So, I’d rather have the sharp point, than go for a drop point or a tanto point. A clip point gives you a sharper point, but it is weaker than a straight sharp point as well. Finally, the Gerber has a nice rubber handle, with a sculptured grip. That makes it both easy to hand onto and comfortable to use. It’s not likely to slip from my hand while I’m using it or even if it gets wet with blood in a fight. While the sculptured handle is a bit uncomfortable when holding the knife low, with the blade up, I can still hold it firmly and I know which way the blade is pointing. While I’m sure that there are lots of other opinions out there, I’ll stand with my Gerber. This is the best knife I’ve found, without paying a fortune. If you want a knife you can count on, take a good look at the Gerber Steadfast Fine Edge Knife.